Everyone knows what a big difference a nice, comfortable sofa makes to your home and your standard of living. Our sofas are probably the most used pieces of furniture in our home. We like to use them for relaxing, watching TV and entertaining; that's why they need to be both comfortable and stylish. Luckily these days you are spoiled for choice. There are so many different designs and fabrics to choose from that you won't have to settle for anything less than perfect. 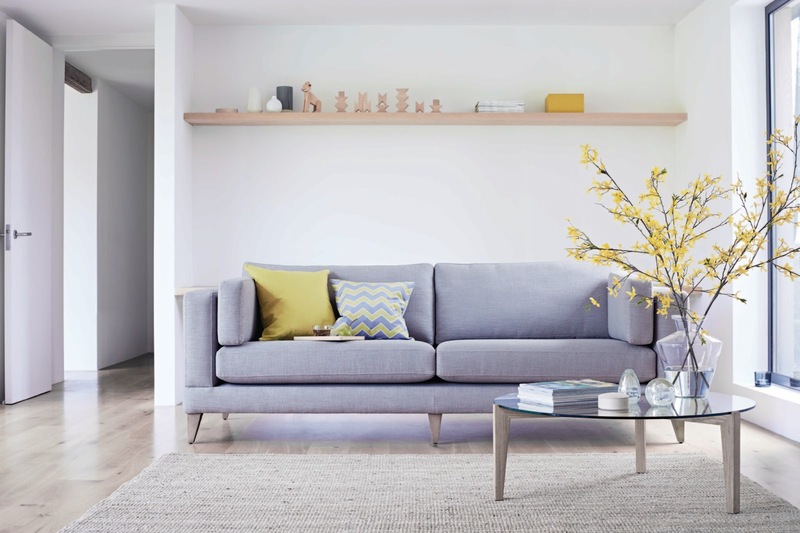 I'm absolutely thrilled to introduce you to a new sofa brand The Lounge Co that opened its doors to the public just last week. I was in total awe the minute I saw their look book. The designs, fabrics and accessories really impressed me. I don't often get this excited about new brands but when I do, I don't hold back. I've picked some of my favourite pieces from their new collection and it wasn't an easy decision at all - everything was just too beautiful! The Lounge Co isn't just another new brand on the sofa scene. They've got the best furniture makers in the country and are part of the group that have been making sofas and chairs for years. Wait until you hear that all the frames are made in the UK and guaranteed for 10 years. Their craftsmen have tested and tweaked each and every sofa to make sure that they are absolutely perfect. You have 12 different sofas, 6 chairs and 6 footstools to choose from in over 100 fabrics and colours. I find their furniture very affordable too which is quite rare to find. Pretty impressive, right? But let's face it, buying a new sofa can be a stressful experience for many of us. It's a long term investment and you really want to find something that is great quality, but also good value. Firstly, you need to think about whether it suits your lifestyle. Is the sofa for a single person, family or a couple? Do you have any pets? How big is the space? What other furniture do you already have in your room? 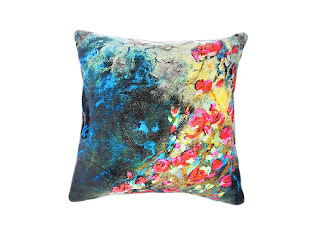 How firm or soft would you like the cushions to be? 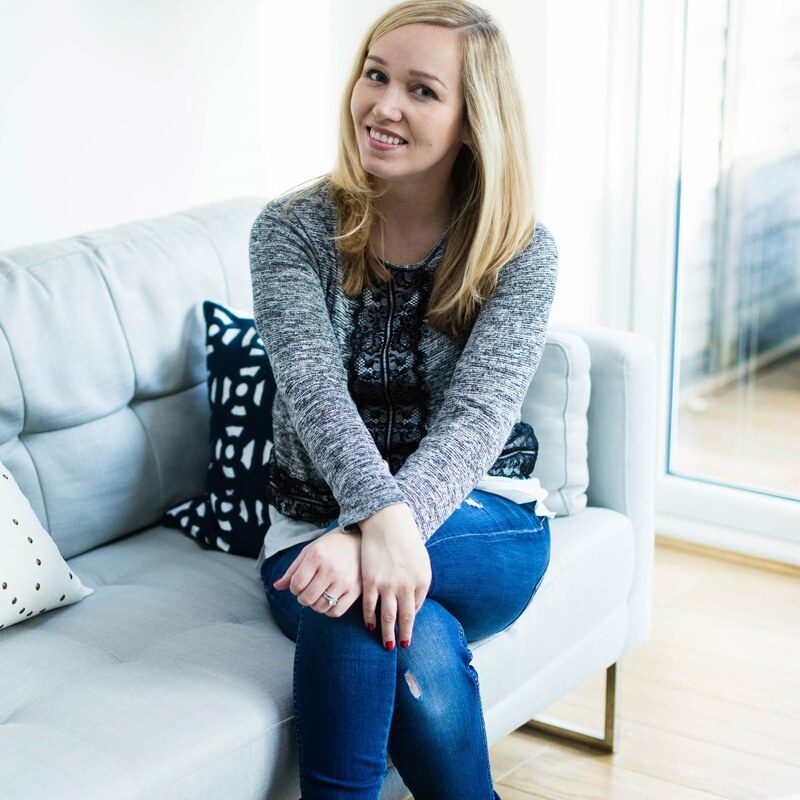 When my husband and I first moved in together, our biggest challenge as a couple was to buy a new sofa. I wanted fabric and he wanted leather. In the end we got leather and fabric just to keep everyone happy. I guess what I'm trying to say is that there are a lot of things that you need to take into consideration when you buy a new sofa, but it should definitely be a fun experience. 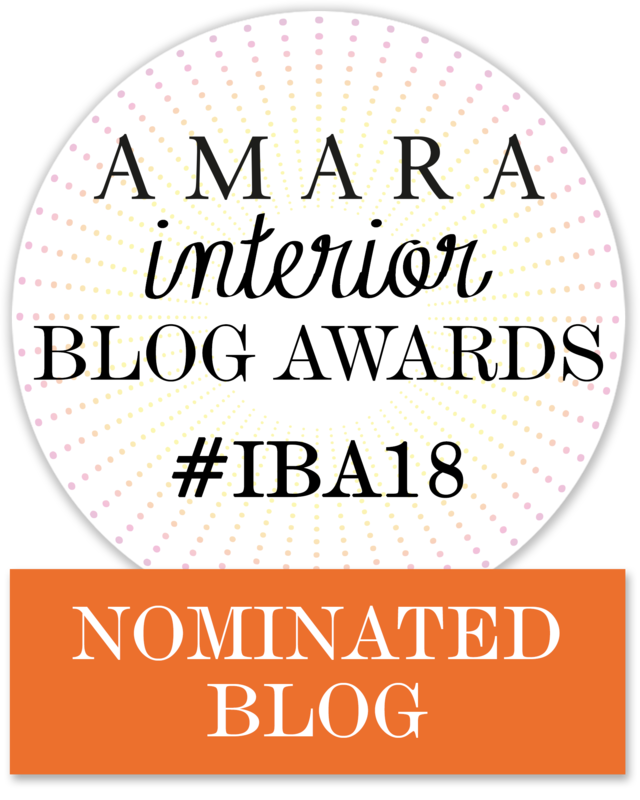 And, the Lounge Co aim to make it fun for you in their 20 new UK galleries where you can get the full experience and take a closer look at this stunning range of furniture. Here are my favourite picks from their new collection! 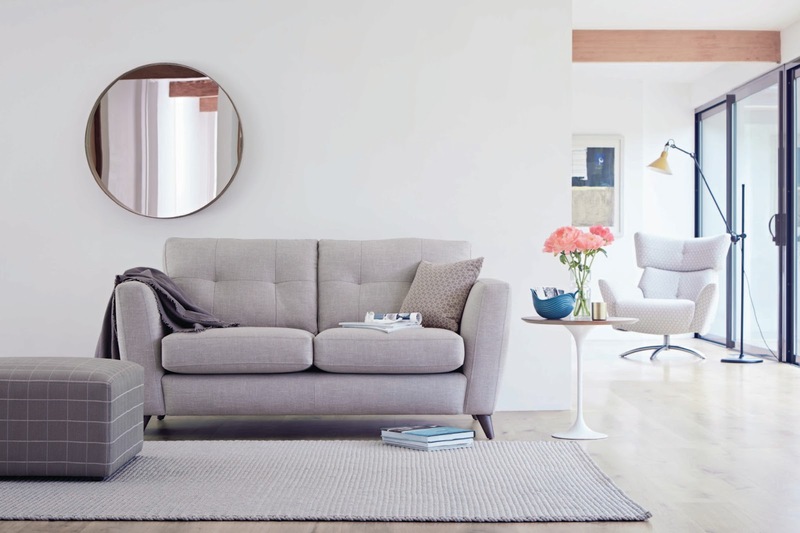 Holly is the ultimate sofa for a style conscious minimalist. It's contemporary, chic and powerful. Holly is probably my favourite sofa in the entire collection. I adore the twin-needling detail, neat legs and the pulled in back cushions which instantly gives it elegance and style. This design is so understated that you will definitely want to jazz it up with some colourful accessories. 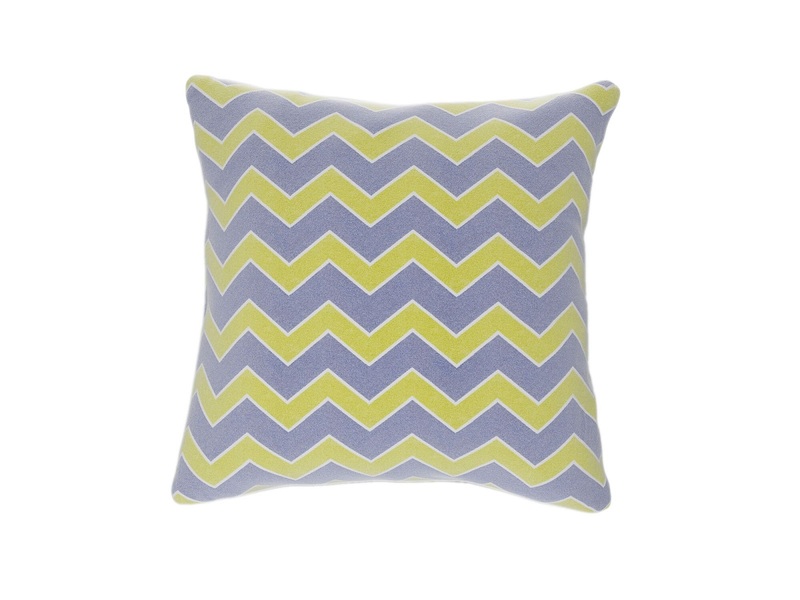 I would pair it with the Geometric Flame Stitch Cushion which will add an instant pop of colour to your room. I think the 2.5 seater sofa looks particularly nice together with the Sixties inspired Jacob Chair. This chair is such an iconic design that it will never go out of fashion. 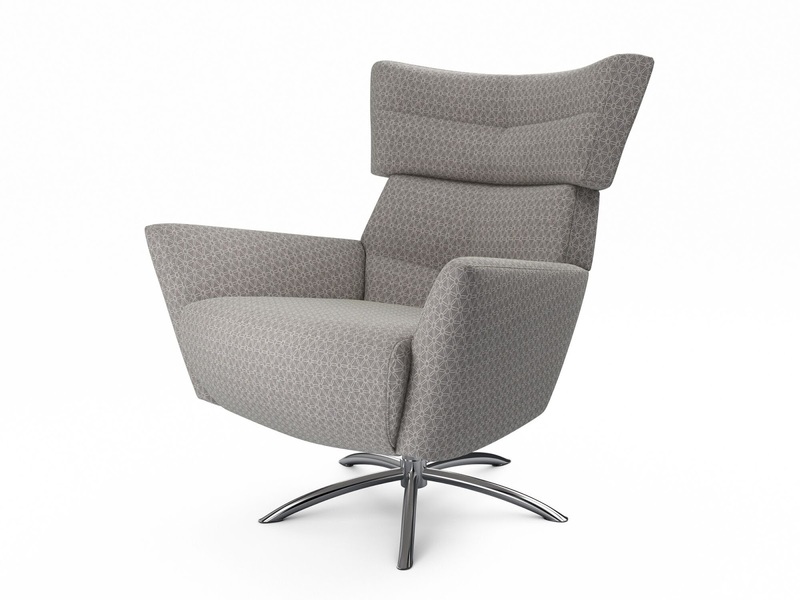 The swivel base is also incredibly practical and makes the chair a great addition to a living room or a home office. I had a tough time choosing between Holly and Lola. I'm still not sure which one I love more but they both have their perks. Lola is definitely a stunner. This sofa just looks so cosy and inviting. 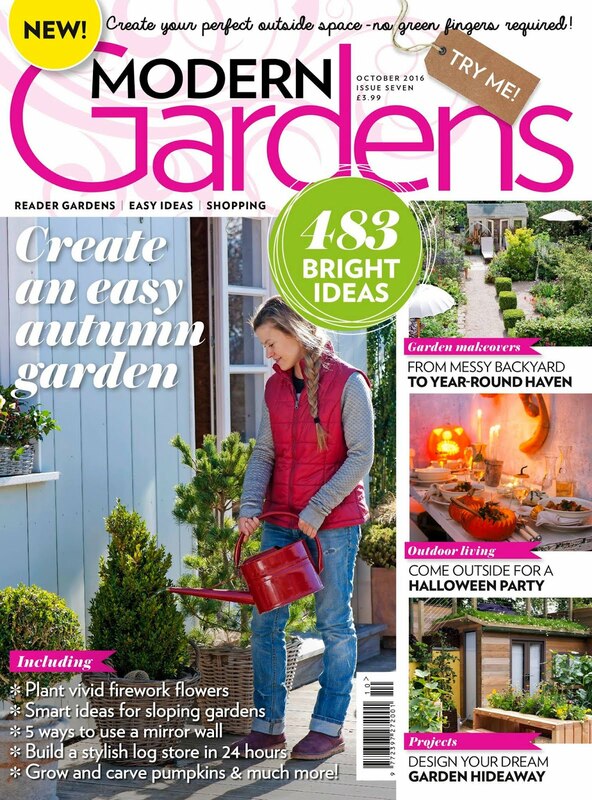 It makes me want to put my feet up and have some much needed 'me time' with my favourite magazine. 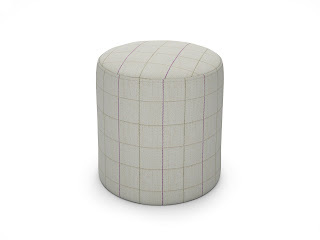 The weave fabric looks absolutely lush and will bring texture to any room. 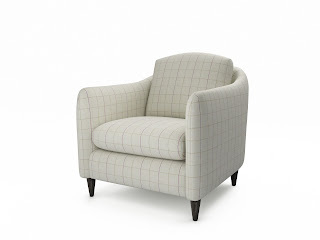 This sofa will work well in both contemporary and country homes. It's got to be one of the most versatile sofas out there! Lola is not your average sofa. It's a modular sofa which means that you can just add another unit to it and expand it as your family grows. 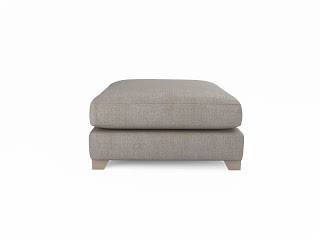 Start off with a 3-seater and add a footstool for some extra room to stretch your legs. Don't forget that modular sofas are also great for casual entertaining! If you are considering a family friendly option, it's worth looking into the Lounge Co's family friendly fabrics. They use Aquaclean® Technology in their soft chenille and family friendly basket weave fabrics which sounds pretty good to me. As a mother of two, I am well used to cleaning up spillages and if there is any way I can prevent them, I'm all for it. Rosie is a classic beauty. I absolutely love it in the check fabric. 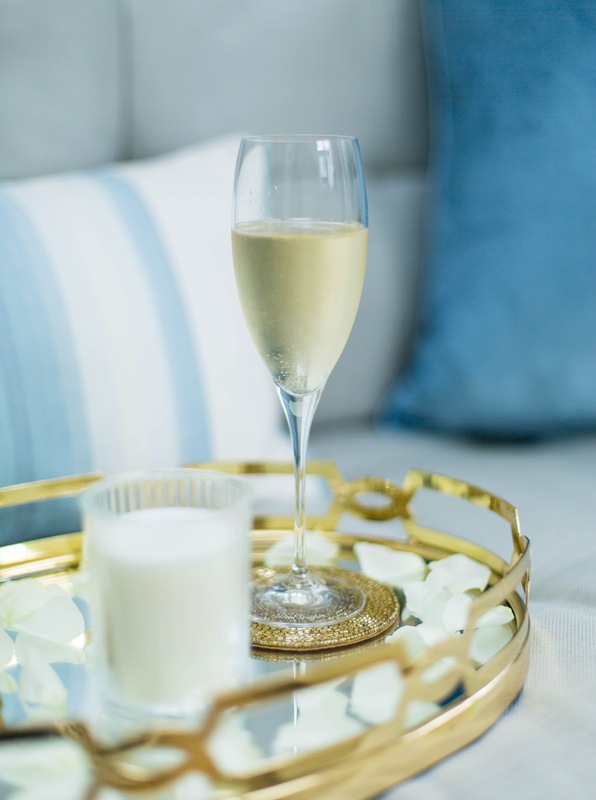 It oozes sophistication and tranquillity. This is the kind of sofa you want to dive into to read your favourite book in dim candle light and forget about the world around you - the perfect spot for everyday escapism! Rosie is definitely a long term investment; it's elegant and stylish so you don't have to worry about it going out of style. If you are a fan of neutrals, try to accessorise the room with few bolder colours that will make your home décor stand out. 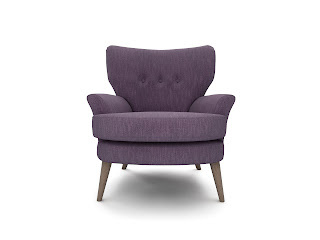 The Noah Chair in purple velvet is very luxurious and goes particularly well with this sofa in my eyes. Velvet is super soft to touch and will add immediate texture and elegance to your living space. 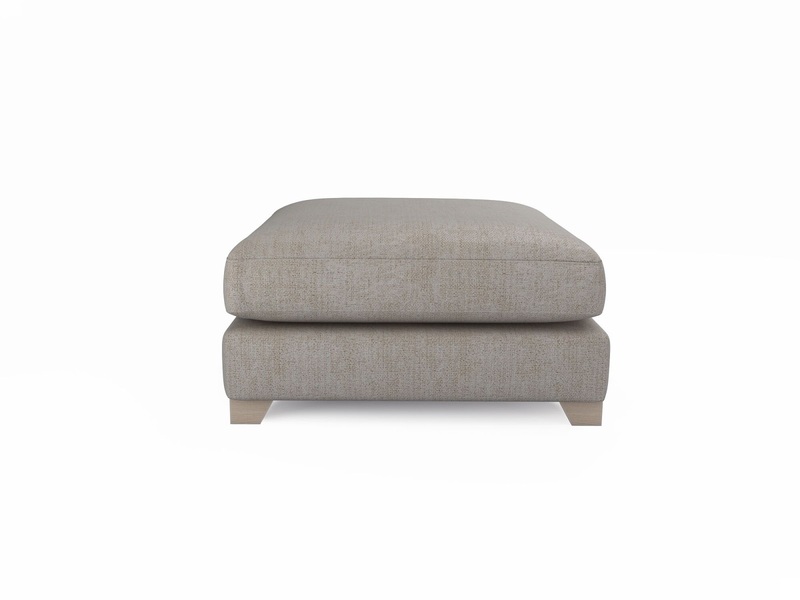 You could also add a footstool to elevate the legs or make it double up as a side table. Just add a small tray on top of it and voila - you've got yourself a table! 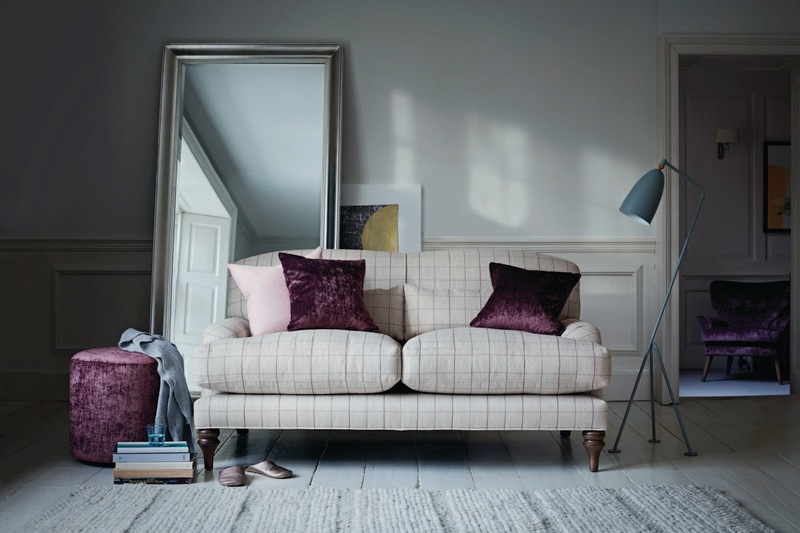 Georgia is another stylish, slim lined sofa range with refined details. What I love about this sofa is that it looks equally stunning in fabric or leather. The stiching on the beige leather looks beautiful and let's not forget how easy leather is to wipe clean! This is the ideal sofa for modern homes and I do feel that the sleek design looks particularly well with minimalist, industrial style furniture. Somehow I consider this as a more formal sofa. I'm not sure why. 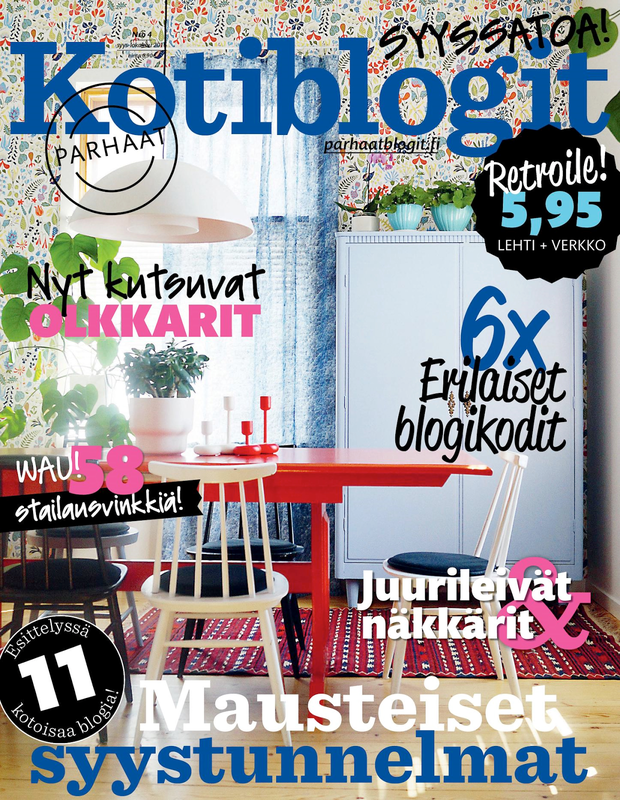 The style is quite grown up and I think it would look great in a swanky Batchelor pad. 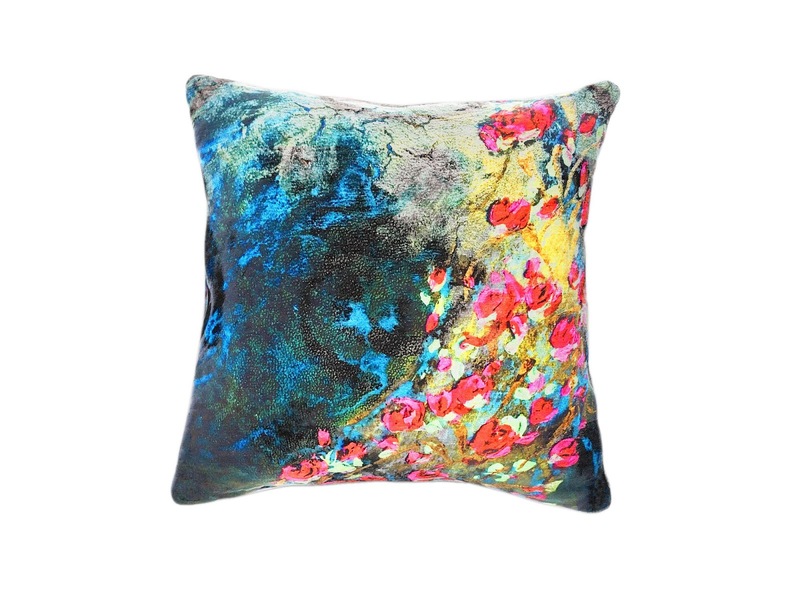 Colourful accessories will always brighten up your home and cushions are one the most affordable ways to update your seasonal décor. If you have a large open-plan living space, there are few options worth considering. 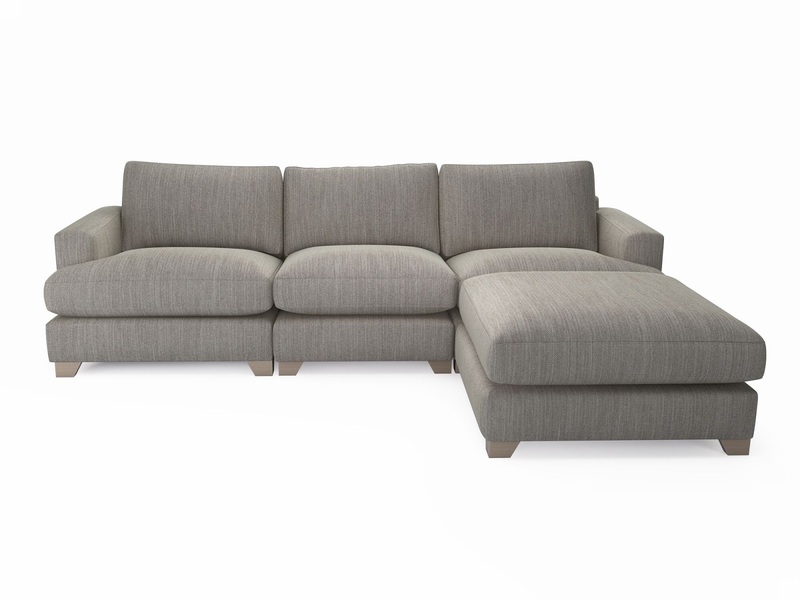 Rather than getting a big modular sofa, go for a 2.5 seater and two arm chairs. It will be nice to break up the pattern and having chairs face the sofa will be a lot more convenient if you do a lot of entertaining as you will be able to face people when having a conversation. 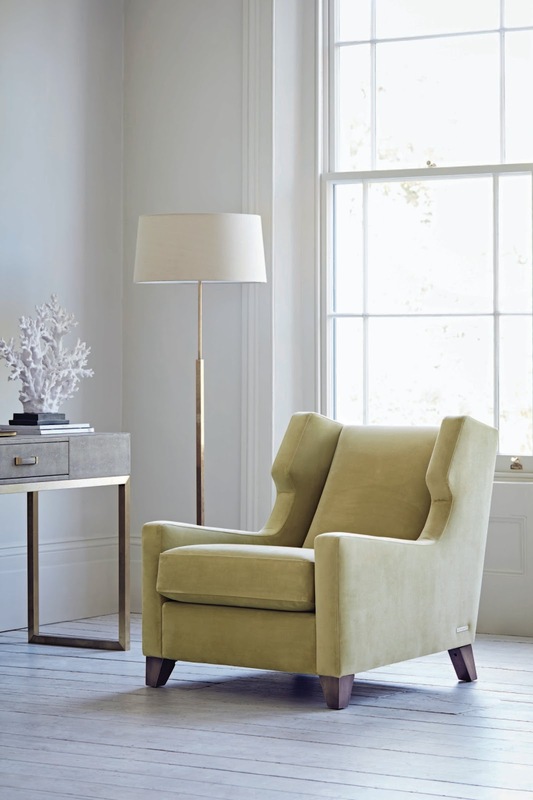 I love the stylish George Chair. 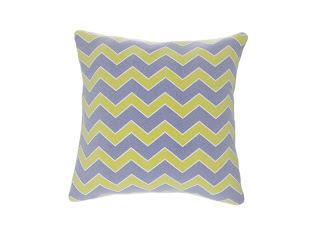 You can easily pair it with the Georgia sofa or use it as a stand alone statement piece. 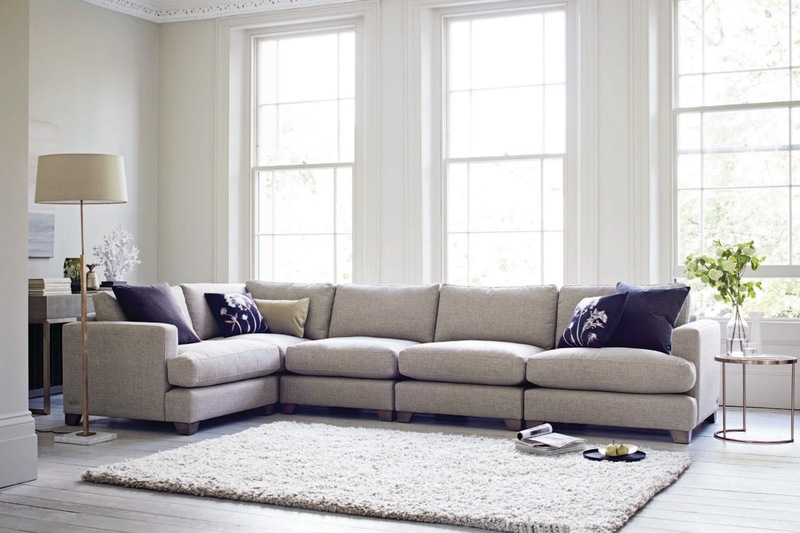 Sofa is such an integral part of your home which is why it's so important that you get it right. Research, measure the room, get free fabric samples to take home and go and view the furniture before buying if possible. Sit on the sofa, feel the springs through the upholstery and think carefully which design is made for you to stand the test of time. The great thing about visiting showrooms is that you'll be getting a lot of advice from the furniture makers which will help you in your decision making process. Take your time, have fun and enjoy the whole experience! I'd love to know if any of these sofas really stood out for you and why? 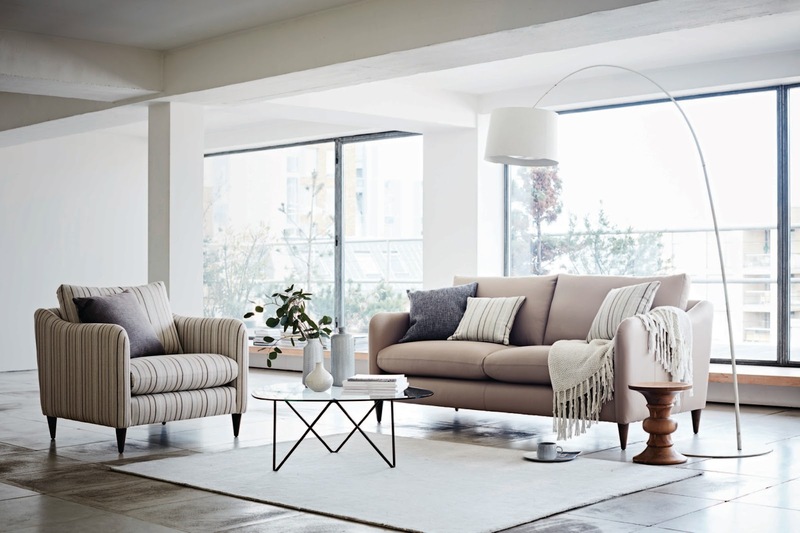 Would you go for a neutral colour or a statement sofa? *Although this is a sponsored post, all thoughts and opinions are my own.